Maypearl got it's name the same way as Penelope in Hill County. When the International-Great Northern Railroad came through, (1902) Penelope was named after the Railroad President's daughter and when it reached Eyrie, in 1903, the town was renamed in honor of two other railroad official's daughters. Further north, Venus was on the railroad's route, but was named after a local girl. 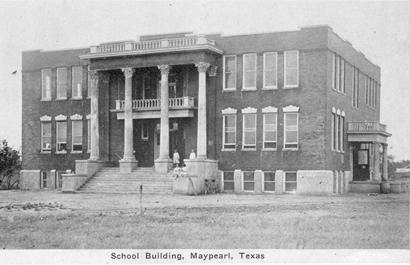 Maypearl was incorporated in 1910 and its history is not unlike its neighbors. All enjoyed prosperity immediately after World War I and all lost people to the draw of larger cities during the Great Depression. Maypearl's population, however, remained somewhat constant through the depression. In fact the population was virtually unchanged from 1925 to the mid-60s with 350 to 400 people. People from Maypearl call themselves Maypearlians. Maypearl has suffered several fires and vacant storefronts where the buildings once stood are filled in to conceal the gaping spaces.